Collier Heights is a neighborhood in the southwest corner of Atlanta, Georgia. 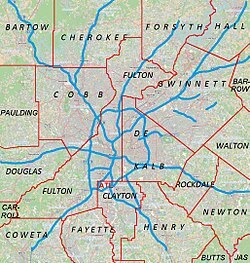 It is bordered to the west by Fairburn Road, the east by Hamilton E. Holmes Drive, the north by Donald L. Hollowell Parkway, and to the south by Interstate 20 bridge at Linkwood Road. It is one of the first communities in the nation built exclusively by African-American planners for the upcoming Atlanta African-American middle class and has been featured in several national publications such as Ebony and Jet magazines, as well as featured in the “Homefinder” section of the Atlanta Journal-Constitution. In 2008 Collier Heights began its quest to become the first community in the nation to be registered as a Historic Site, listed on the United States National Register of Historic Places. On June 23, 2009 the community achieved its goal. The community achieved local historic designation in June 2013. The neighborhood was founded in 1948, and boasts several famous and history making homeowners, such as Martin Luther King, Sr; noted Civil Rights Attorney, Donald Hollowell; Ralph David and Juanita Abernathy, and Christine King Farris. Collier Heights is also home to several prominent figures, such as U.S. Congresswoman and Presidential nominee from the Green Party, Cynthia McKinney; television actor Emmanuel Lewis from the "Webster" television series; Georgia House of Representative Member, Billy McKinney; Attorney and former State Senator, Leroy Johnson; television actress Jasmine Guy from Diff'rent World; and Asa G. Yancey, Sr., one of the first African American doctors in Georgia. Herman Russell, Contractor and civic leader. The Collier Heights Community Association (CHCA)– The Collier Heights Community Organization, which formed in 1968, is the largest and oldest neighborhood organization in Collier Heights, encompassing the entire communities/neighborhood. Key committees within the CHCA are the Historic Committee, which focuses on master planning for preserving the history of the community and neighborhood improvement projects. The CHCA organizes a number of festivities throughout the year, such as the National Night Out-a summer block party, a Christmas party and the "Salute To Legends" celebration, which pays homage to the famous history-making residents of Collier Heights. Executive committee members are voted into office for one-year terms. Elections are held in December at the Association's annual Christmas party. The CHCA meets the second Tuesday of every month at Berean Seventh-Day Adventist Church (291 Hamilton E Holmes Dr NW, Atlanta, GA) at 6:30pm. The City of Atlanta declared September 8, 2009, as Collier Heights day, presenting the community with a proclamation for its historic significance in the city and the nation. Similarly, Fulton County, Georgia, declared September 16, 2009, as Collier Heights day in the County. In 2008 Collier Heights began its quest to become the first community in the nation to be registered as a Historic Site, listed on the United States National Register of Historic Places, due to its significance of being the first community in the nation built by African Americans for their fellow African Americans. On June 23, 2009, the community achieved its goal. The community achieved local historic designation in June 2013. Atlanta–Fulton Public Library System operates the Adamsville–Collier Heights Branch. Besides the main arterial road, Collier Drive, other roads include Waterford Road, Hamilton E. Holmes Rd, and borders Donald Lee Hollowell Pkwy. MARTA serves Collier Heights with the Hamilton E. Holmes transit station, which is the system's western-most route. ^ Cyriaque, Jeanne (December 2009). "The Collier Heights Historic District: Atlanta's Premier African American Suburb" (PDF). Reflections. Vol. IX no. 1. Georgia Department of Natural Resources Historic Preservation Division. pp. 1–4. Retrieved August 19, 2018. ^ Riley, Betsy (April 30, 2010). "A Separate Peace: Collier Heights". Atlanta Magazine. Archived from the original on March 12, 2018. Retrieved October 12, 2018. ^ "Adamsville-Collier Heights Branch." Atlanta–Fulton Public Library System. Retrieved on February 24, 2010.